In the wild, human-elephant conflict has become one of the major challenges in elephant conservation, as loss of habitat and fragmentation forces elephants and humans into competition for the same, limited space and resources. To combat human-elephant conflict, a number of conservation programs have sprung up in Asia and Africa to educate communities about these animals and help shift perspectives on their interactions. One such program is the Biodiversity & Elephant Conservation Trust, which conducts—with support from Woodland Park Zoo—the Schools Awareness Program in rural schools in Sri Lanka, where human-elephant conflict is an ongoing threat to elephant welfare. The program has been ongoing for the last seven years at the rate of around 150 schools per year, seeking to reach as many school children as possible. The objective is to create an awareness of the elephant and its conservation among the children, by way of lectures with slides and video, Q&A sessions and discussions. 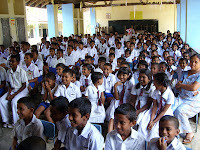 At the end of each session, the Schools Awareness Program donates a set of books to the school library. In 2007, funds given by WPZ helped carry out 40 sessions, reaching 4,784 students and 417 teachers. Through these sessions, the Schools Awareness Program has given children a clear understanding of the elephants and their habits and behaviors. With this knowledge will hopefully come a shift in attitude toward the elephants; perhaps even to the extent that some of the students will play a proactive role in elephant conservation in the future. It's great to see such young faces involved in a conservation project. Thanks for highlighting this project, Jona. I am happy something is being done to save the elephants. Several years ago I saw a sickening movie at the zoo of elephants hauling away the trees they needed for habitat. Thanks for highlighting this project. Emerald City Search is back! High in the air with the greatest of ease!